The wedding cake is often a focal point during your reception - choosing the right cake can enhance the atmosphere, and if it is made well, give your guests a taste to remember! If your having a traditional wedding you might consider having a traditional wedding cake with a fruit tier and a sponge tier, as not everyone likes fruit cakes. If you're having a contemporary wedding then you could have a more novel wedding cake perhaps reflecting your personality. On your wedding day you can ask your caterer to slice up the wedding cake so that your guests can all have a slice! As I said before we have a traditional wedding cake. We found a design we liked in a wedding magazine and I asked my mother-in-law to make the cake and my husbands aunt decorated it. Of course we saved money as they both wanted to do it for free. Don't you just love the in-laws? If you are going to ask someone you know to make your wedding cake for you and they will not except money be sure to mention their name on the wedding day and present them a bouquet of flowers during the speeches. Set yourself a budget and ask the designer if they are able to work within it. Ensure they are able to arrive early to the venue and set the cake up as the focal point of your reception, all as part of the total cost. Check they can deliver your cake to the venue. Check that the delivery charge is part of the total cost of making the cake. Check if they make favours too, as they might offer you a discount. Ask to see a portfolio of the designers work, particularly their most recent designs. 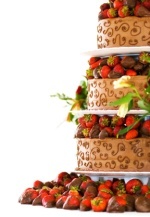 Ask what provisions they make if there are problems with the wedding cake. Check that you have exclusive use of the designer on your wedding day, as you don't want them just rushing the presentation of your cake in order to get to another wedding. Book your cake early. Fruitcakes cannot be baked in a week, as they need time to mature. For most people not having a wedding cake at their wedding would be unthinkable. But open your minds to alternatives, or even an addition to the classic wedding cake. For all you chocolate lovers out there, the chocolate fountain provides an irresistible aroma and beautiful display of cascading luxury Belgian chocolate to tantalise all who see it. Your guests can dip a variety of fondue foods into the fountain including marshmallows, strawberries, exotic fruits and profiteroles. These are eye catching sculptures made of sugar and mixed media, something which is sure to get all your guests talking about long after your wedding day. They can also be designed to hold cake in the base. So you can have your cake and eat it! Create a unique sculpture for your wedding day. That will allow your guests to watch it delicately melt throughout the night. If your wedding is based on a particular theme the sculpture could be used to complete the picture. If your guests are feeling a little hot on the dance floor you can invite them to cool down with the spirit luge. The spirit is poured into the top of your sculpture and is chilled by the ice as it passes down and is caught into a glass or straight into the guest's mouth at the end. Above all, make sure you enjoy your wedding cake.